Should I unfriend Members of my old church? In many church systems, there’s pastoral change each year: pastors retire, pastors move from their church to replace them, pastors move to replace those pastors…it’s a chain of transitions. But in the age of social media, gone are the days of “well, see ya again someday” with former church members. If you are Facebook or other social media friends with your church members, you continue to have contact after you leave. So the question comes up every year: Should pastors unfriend their former church members? Should they keep being involved in their social media lives? It’s a touchy question in the digital age that pastors agonize over. Thankfully, you are reading this page. 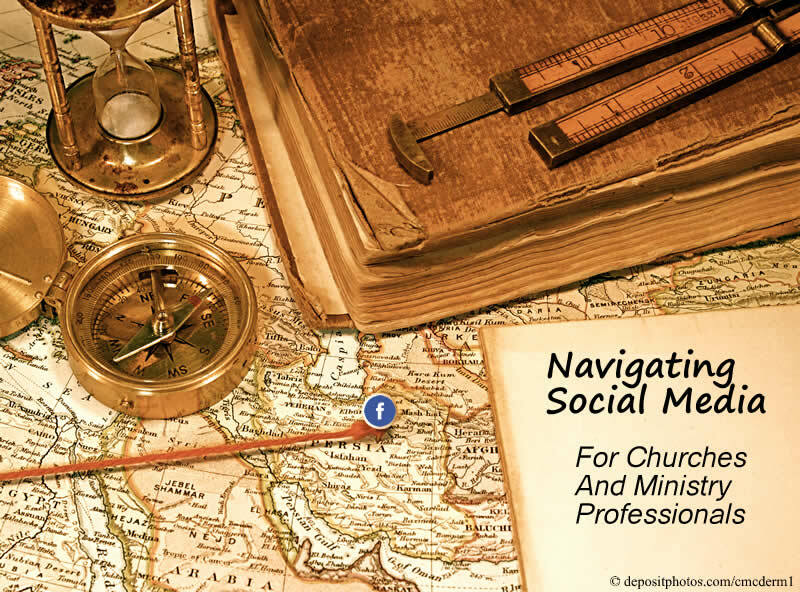 This is the Fourth Edition of our Facebook Guide for Pastors in Transition, and we have a tried-and-true method for you or your pastor to both maintain connection to their previous church while focusing their social media engagement with their current church. Should pastors unfriend their former church members? Some say that a few bad eggs who abuse social media connections after a move should not cause everyone else to have to cut ties. Hacking Christianity claims otherwise: fiscal malfeasance, child abuse, and other bad actions by individuals have caused us all to be more aware of our relationships and our accountability–and this extends to digital interactions. 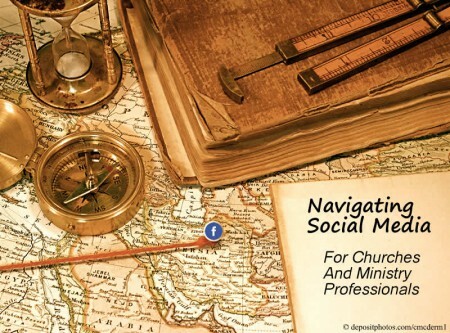 While some people may choose to simply unfriend their church members, our suggested method of using the three tools of Friend Lists, Privacy Settings, and Unfollowing allows pastors to maintain connections to former parishioners while limiting their interactions going forward. There’s a simple three-step process to categorize your former church members. All of the below are PRIVATE actions, meaning no one knows anything about your friends lists and follow lists. 1. Make a Friends List. 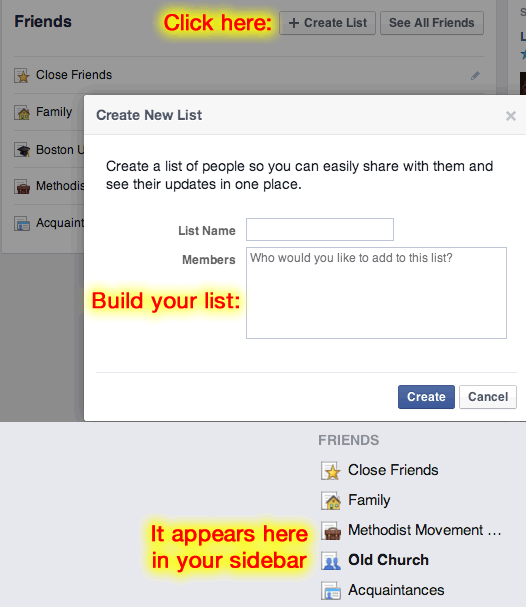 Go to this page on Facebook and click “Add New List.” Name it your old church name/location. 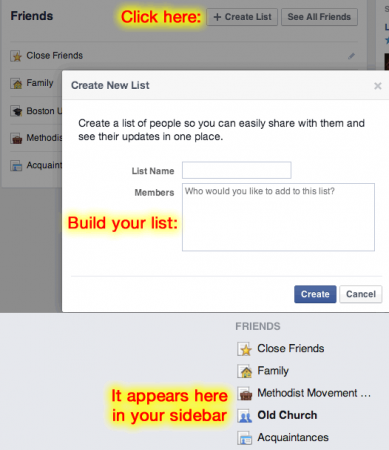 Add parishioners from your old church to this list and click save. 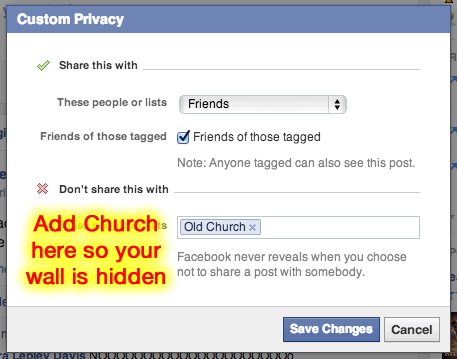 Under “Don’t share this with…”, type in your old church’s name and it should come up. Click on it, and save changes. 3. Remove former church from your news feed. This one is a bit tedious but it’s only tedious once. Go to each member of your Old Church list and click on their profile. See the “Following” icon at the top? 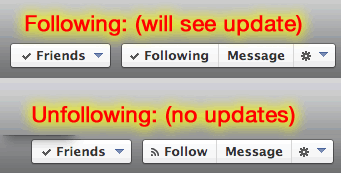 Click it so it reads “Follow.” This means that although you are still friends, they will not show up in your news feed. Rather than defriending and severing connections, this process allows you to post on Facebook without continuing interaction by old church members, and it “removes the temptation” to see what people are up to in your old church. But instead of defriending, you are still connected. If you hear of a baby being born, you can type in their parents’ name in the search box and still see the pictures. If you change your profile picture, your old church members can still comment. But by and large, your posts will not show up on their timelines, and theirs will not show up on yours, so your day-to-day interactions will be more focused. When in doubt, unfriend them. If you are unsure if they can handle the transition or if you can’t handle it, unfriend them. It might be painful for them when they realize it, but it hurts less in the long run. This is underlined because it is really important. Give VETO power to the following pastor. If you ARE doing the recommended procedure above, let them know. If they are not comfortable with it (given a reasonable amount of time and digital exposure) then you have to be okay to go nuclear and unfriend them. You have to respect the following pastor’s ministry, and it is in the best interest of the congregation to do whatever is best. For Methodists, you are an apologetic for a connectional system, and should do the same in honorable ways in the digital milieu. Next up: Social Media Differently! Click here for Part 2 . Excellent article on how to follow discipline. I do like the clear step by step instructions. HOWEVER I WHOLEHEARTLY DISAGREE WITH THE DISCIPLINE ON THIS ISSUE. Seperating ourselves as a seperate class of christians because we served as a pastor is detrimental to the church body as a whole. We serve as a small part of a much larger body. I have prayed with, worked side by side with and shared our lives together. The edict to ignore that facet of healthy christian community really needs close examination going forward. We have a denomination in severe trouble and I can make a strong case the more we elevate ourselves above the parishioners we have helped create this mess we are in. We treat our fellow Christians and our relationships with them as disposable and thus create an unauthenticate relationship paradigm that builds a barrier to Christian growth. I disagree David. As someone who has followed colleagues a couple times who just didn’t get this, following someone who maintains personal contact because of the strong ties they have with parishioners, it has caused nothing but trouble. And now, with social media, these guidelines are so needed. When I see comments and pictures and interaction with church members and a previous pastor before I have even had a chance to respond, it takes away from the opportunity I have to not look like an also-ran. And I generally get along well with my predecessors- it isn’t jealously or turf or defensiveness, it is just that relationships are built often on the little things as well as the big moments, and if those little things are derailed or impacted by a predecessor, it hurts that budding relationship. To be clear though, my “rules” are a little different. I didn’t “unfollow” or “unfriend” them all, but I do not “like” or “comment” until the pastor of my previous church has had a chance to respond. And even then, I do it sparingly. I don’t want them to feel that they have to compete with me. No different than any other contact with former church members after a move. You don’t return for visits, etc. Electronic methods are no different. Move on to new field. Stay out of the way of the new pastor on the old field. Great post. Unfortunately, the clergy who have poor boundaries and cause grief to those who follow them won’t be reading this.